Located at the crossroads of two of Athens’ main thoroughfares, near the heart of the city’s historical center, is Athens Heart, a 20000 square meter shopping mall that offers all the amenities of modern retail. 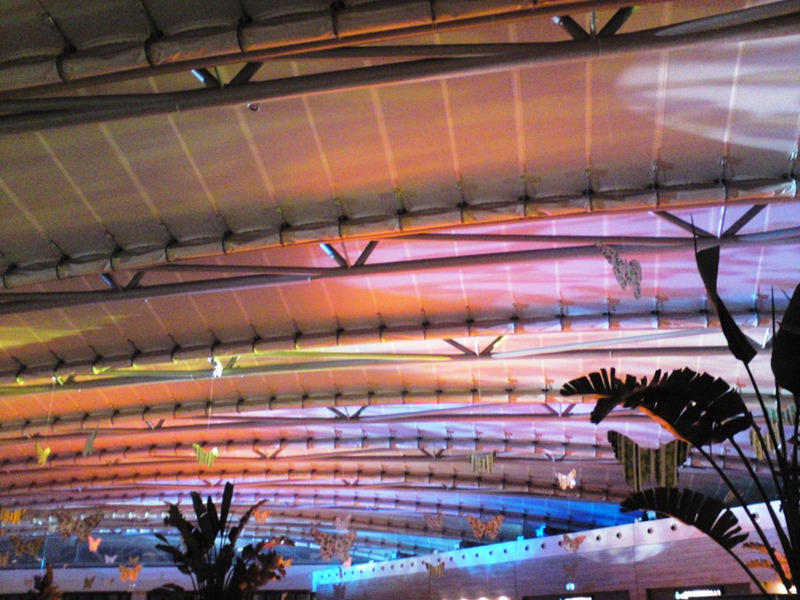 The atrium of the shopping mall, the main gathering spot for shoppers, is covered in a translucent membrane roof that allows ambient light and shadow to play across its surface by day, but at night was drab and lifeless. Martin Professional’s Greek distributor, Panou SA, was tasked with livening up the interior ceiling and consequently installed Exterior 1200 Image Projector luminaries to project dynamic color and pattern across the huge surface, giving a new dimension to the large interior space. The roof refreshment uses the structure’s multiple arched segments as a multilevel projection screen, which gives the visitor a different visual result depending on where they stand. The Martin Exterior 1200 Image Projector is an award-winning, 1200 W, full color mixing luminaire designed for projecting animated images and effects to create truly dynamic architecture. It includes an animation wheel for the easy projection of illuminated textures and animated effects such as reflected water, ripples, flames, clouds, foliage, rain and snow. The lighting installation at Athens Heart consists of 23 Exterior 1200 Image Projectors, 1 PC-based LightJockey controller, 14 DMX splitters and a Martin 2510 playback controller. The DMX network design and LightJockey programming were completed by Michael Kontogiannis of Panou SA.